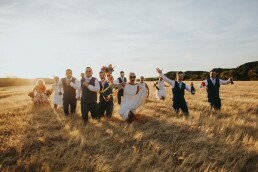 So Holly + Craig’s big day had arrived and it was set to be a scorcher! Good job we were heading out to The Boathouse. As the name suggests, it’s right on the water and offers a gorgeous setting for weddings. With the sun beaming down I set off to meet Holly and her girls at her house. As I walked in it was like a photographers dream. White walls, clean lines, a beautiful setting to get ready for a wedding. The girls welcomed me in and Holly’s parents were super friendly and great fun all morning. Getting ready is a beautiful part of the day. You can capture so many emotions in such a small amount of time. Giggles and nerves aplenty too. After a while, the weather took a turn with thunder sounding off in the distance. A classic but unwelcome summer storm. A brief rainfall was all it took to clear it and the worry over a washout wedding was over. I understand why a lot of Brides don’t like the rain but after my 2016 season, I have come to welcome it. It offers stunning light and if B+G’s are feeling brave it’s a great laugh heading out into it. Rain and storms have a way of allowing people to feel closer to nature. It’s a humbling experience to be in a storm and an exciting experience taking wedding portraits in them. Anyway, the clouds parted and the sun shone brightly ready for Holly to make her way to The Boathouse to meet Craig. A sweet ceremony was held and after that myself, H+C went for a little boat trip around the broad. This boat trip is in the prettiest boat I have ever seen, check the photos and if anyone wants to buy me one just send me the best part of £70,000, please! 😉 The day wound its way to dancing with a steady flow of happiness, laughter and the odd trip to the park with a boss bridal squad! A beautiful first dance with DJ Paul Allen at the helm happened and then the sun tipped its hat and left us with a beautiful sky to play with. I like sunsets, also I love weddings!